Note that when focusing on legacy spanning tree, we are actually focusing on per vlan spanning tree + which runs classic STP per vlan. We don’t actually have the option of 802.1D or classic spanning-tree in our switches. Before we begin you should know what a burned in mac address is (BAI MAC) it’s the hardware mac address of the switch that you cannot change, it is how we will identify the switch. Any ports left over should be in the blocking state. The lowest bridge ID in the L2 network is the winner. By default the lowest mac address becomes the determining factor. However if we wanted to actually carve out the L2 path and elect a root bridge properly, we would need to edit the priority. Priority takes precedence in the Bridge ID. How to manually change the bridge id to elect a root bridge? The command above looks at who is currently their root bridge, and picks a bridge priority lower than that to beat it. If you choose secondary then it will pick the second highest. Now that we know how the “root” bridge is elected, let’s get into some details. Bridge protocol data units (BPDUs) are sent every 2 seconds by default. In this case when switches come online, they will all elect to be the root, only until they receive superior BPDUs will they stop transmitting their own bridge ID as root but their will transmit the elected root. You should remember that BPDUs really carry two pieces of information, the current bridge ID and the root bridge id. Notice in the above packet capture this BPDU shows this bridge, and then the root bridge. Just by looking at this we can tell that the root bridge was elected so because of the lower MAC address. When ports initially come up in 802.1D they go into different roles, first they go from disabled to listening state (15 sec listens for BPDUs), then the learning state (15 sec learns mac addresses) then finally a switch can choose to go blocking or forwarding. Blocking being not allowing traffic to pass, but still listening for BPDUs. Forwarding being sending, receiving data and BPDUs. A pink switch comes online and thinks he’s hot stuff, tries to declare himself root. Then he sees the better BID and stops transmitting himself as root on his root port. Instead now he just listens on his root port for those BPDUs, and on his designated ports he sends this new root out. Here’s the BPDU he’s now sending on his designated ports. That completes the lesson of how the root bridge election happens. This continues to happen down stream until everyone has converged. 1. The port with the best cumulative “cost” to the root bridge becomes the root port. All other paths to the root are blocked. note about cost: When switches send BPDUs downstream to designated ports they advertise the total cost to the root that they had + the cost of their root port. 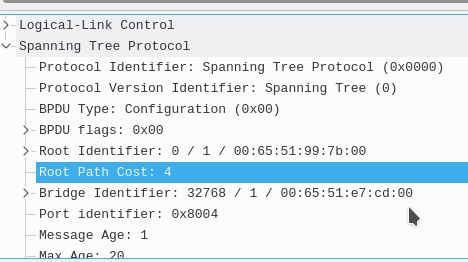 When you run “show spanning-tree” you are seeing the root cost or the cost that is sent to you. You need to add in your root port’s cost to that calculation for total cost. A cost of 0 means we are directly connected to the root bridge. NOTE: In 802.1D Spanning-Tree switches do NOT send BPDUs on Root, or Alternate ports. In fact they only send BPDUs on designated ports. The only exception is a TCN BPDU to the root bridge and during bridges coming online. Changing these per switch has no meaning. Only the root bridge can set these and propagate them down. When a port NOT configured for portfast goes from learning to forwarding, OR down, the switch will send a TCN BPDU towards the root bridge on it’s root port. Once that TCN BPDU is sent to the root, the root sends back Topology Change acknowledge (TCA) BPDU back to the switch. 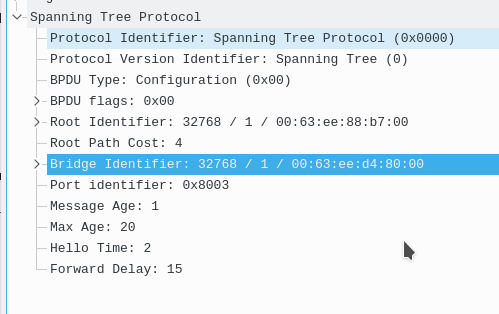 Then the root bridge then sends a config + TCN bpdu to all switches, the root bridge does this for max age + forward delay (20+15=35 sec) by default. We are on SW2 and we bring up the link of g0/2 to a host, that IS configured for portfast. This is the only BPDU that came on the link between SW(root) and SW2(non-root). That’s what port-fast does, it prevents TCN BPDUs from being sent out. Now here is the capture from the link between SW1 and SW2. SW2 who normally never sends BPDUs out of it’s root port now sends a TCN BPDU via it’s root port. Now here is SW1(root) sending the TCA BPDU back to SW2 acknowledging the message. Most of the things we discussed in 802.1D are carried over, even the toolkit features. 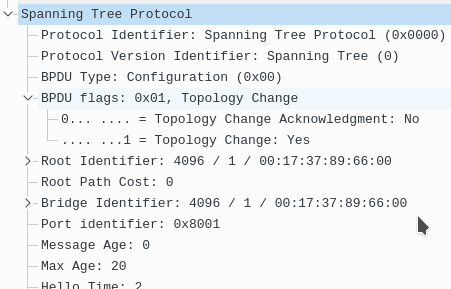 Rapid Spanning-tree Protocol is the new algorithm for the calculation of the tree. The IEEE standard is 802.1W. What once took 30 seconds to start a link now is instantly. The port roles are now NOT tied to the states. Alternate – A port towards the root bridge with a worse cost (uplinkfast now built into 802.1W). Operates in the discarding state. These edge ports lose their edge status and go through listening and learning if they detect a BPDU coming in. This is automatic. In previous versions of STP the TCN behavior was the switch sends a TCN to the root bridge and then the root bridge generates a config BPDU with TCN flag to forward downstream. Now what happens is a TCN is generated, it’s forwarded out all forwarding ports, then when a switch receives this frame, it will flush it’s cam table (for that vlan) out on all ports except the one the BPDU came in on. The topology must be rebuilt doing unknown flooding. ONLY point to point, non edge, designated ports use the sync process. The sync process in RSTP is the bread and butter of the whole fast convergence. When a new port (non-edge) comes up between 2 switches it’s put into the designated role, blocking state then they both send their BPDUs claiming their root. If they both receive them, then the sync process starts. The BPDUs they send are config BPDUs with the proposal flag set. Once the downstream switch agrees that it is not root, it will start a sync for it’s possible downstream switches. If it does have any, what will happen is they will have their own sync process, or if they are edge ports they will be skipped. Finally once all of the downstream switch’s ports are sync’d, it will send a config BPDU with the agreement flag. 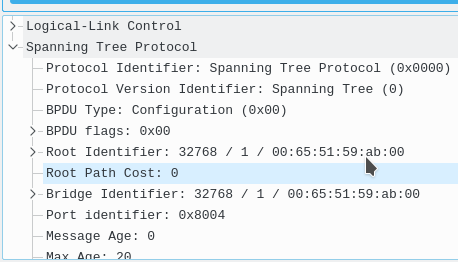 This is why “spanning-tree portfast edge” is so important in 802.1W, because if a port is not a switch and is not edge, it could hold up the sync process during a change. The sending of the config BPDU + agreement flag tells the upstream switch to unblock the port. RSTP will consider a root port dead if we miss 3x hellos on it (and the link is not gone) STP process errors or similar traits. Loopguard – loop guard is still relevant in RSTP as it protects us from that specific scenario. As stated earlier uplinkfast is built into RSTP and a loss of the root port will immediately cause the alternate port to run the RSTp synchronization process. No extra configuration is needed, this is the default. RSTP has a built in replacement for backbone fast. It does not use root link queries anymore. When a switch starts to receive superior BPDUs on a port, it immediately looks at them instead of waiting for max age. Then it compares the BPDU to it’s best one and finds out that something is wrong with the neighbor, trying to become root. Thus it blocks the link. So how do we enable it? The STP and RSTP BPDUs are not compatible, and STP switches do not understand RSTP BPDUs. Thus when an RSTP port receives STP BPDUs it will turn the port into an STP port and speak STP. It will not and cannot use the synch process here. The traffic engineering remains the same from STP to RSTP. We have a bunch of new fields in the MST BPDU, and some changed. 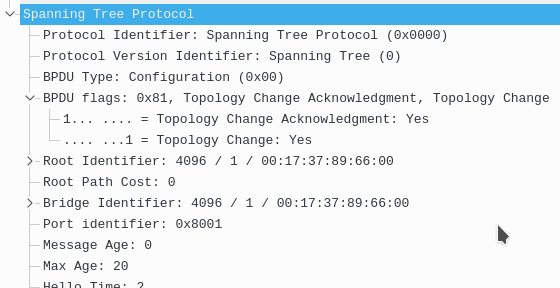 First of all the protocol version identifier is what we would expect, 3 for Multiple Spanning Tree. Here it says we have 2 version fields however I think that might be a decoder error. Finally we have MSTIs for every instance we have. In this case I have 3 instances, 0 (the CST), instance 1 for vlan 2, instance 2 for vlan 3. Originally started as Cisco’s MISTP, then it was defined in a standard as 802.1S, now its under 802.1Q. Decouples the vlan and STP instance. We can scale much higher with the number of vlans we can support. In fact regions are the main enhancement that differs RSTP from MST. There are two root bridge elections in MST. One root bridge election per region, for the regional root. One root bridge election for the topology, for the CIST root. Traffic between regions must first go to the regional root bridge, then must go through the CIST root. A great illustration below, each MST region is seen as one switch. When migrating to MST, what should be changed first in the L2 network to NOT blackhole traffic? The root bridge must be turned MST first or else it’s root ports will go into root inconsistent mode. Again this is because for MSt interoperability, the CSt root must be within the MST domain. 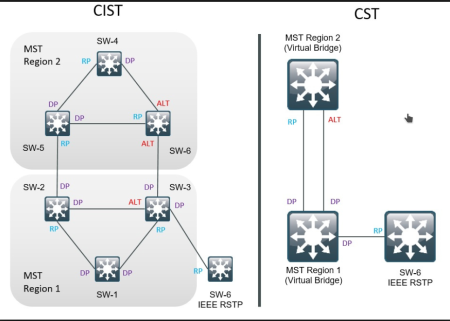 In MST our bridge priority still needs to be unique to guarantee a unique bridge ID, however we don’t use the VLAN ID anymore. Instead we add the MST instance number to the priority. If you do not configure a vlan into an instance, it will be put into instance 0 by default. As we learned earlier from the BPDU most of the MST config is sent out via the BPDU except for the vlan to instance mapping. Instead a md5 hash of this configuration is sent out with the BPDU. If any of the region configuration items like name, revision or the md5 hash differ, the port is treated as a boundary port. A port could be a boundary due to inconsistent configs between switches, or due to running different versions of STP. A boundary port only sends IST BPDUs, never any BPDUs with Mrecords. MSTIs mimic the port role of the IST at boundary ports. MST can also deal with PVST+ and RPVST. MST can detect PVST if it receives more than one BPDU on a port from multiple vlans. If it does it knows the neighbor is running PVST and thus it replicates the IST BPDU out on all vlans for the neighbor. There are 2 rules for PVST simulation to work. 1 – If an MST switch is root, it must be root for all VLANs. 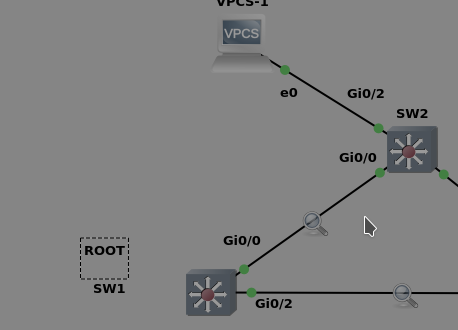 2 – if the PVST+ switch is root, it must be root for all VLANs. The reason for both of these rules is because a boundary port can only be in 1 state, the state of the IST. Even when running PVST the BPDUs are actually just clones of the IST BPDU. This goes back to the idea that the MST region acts as one switch, and ones run CST towards the outside world, the IST. What happens if these 2 rules are not followed? The boundary ports are put into root inconsistent mode. 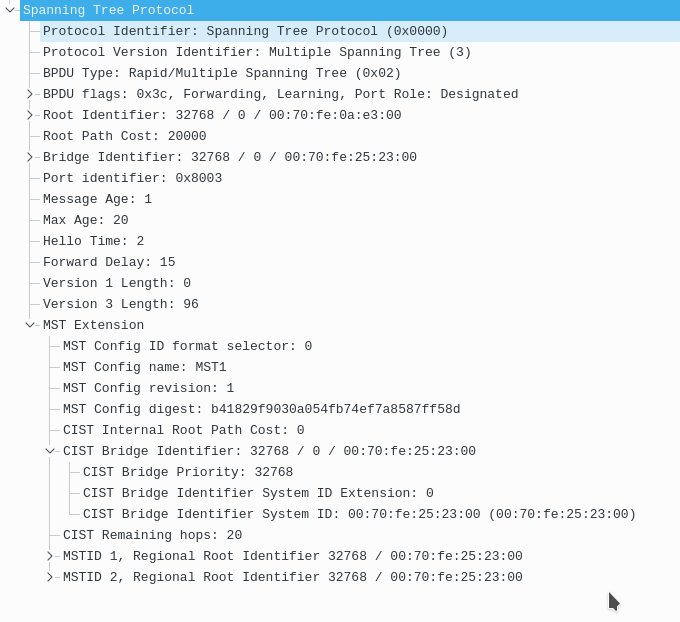 To facilitate compatibility with other versions of STP, MST utilizes the Internal Spanning Tree (IST). The IST, which is instance 0, is responsible for communicating with other versions of spanning-tree, or the common spanning tree (CST). The IST runs RSTP just like the MSTIs. MSTIs are the RSTP instances that operate within the region. Instead of sending a separate BPDU per MSTI, MST sends one BPDU with multiple entries inside. This is shown in the top page screenshot of the BPDU. The entries for each MSTI in the MST bpdu are called Mrecords. These are identical to the bridge identifier in terms of their contents. What common misconfiguration can happen with MST that black holes traffic? Describe how it happens. The common misconfiguration that can happen is manually pruning vlans from a trunk, or load balancing vlans with the IST. The issue with the IST is that it can block these links because it will treat them as loops. The solution for this is to NOT map any vlans to the IST, leave that for BPDU communication. Another solution is to make sure not to manually prune links from trunks so that a blocked link will not blackhole traffic. In the example above the IST BPDU goes out on both ports g0/0 and g0/1 even though both are access ports for different vlans. This is because the IST is the only instance that sends BPDUs. Since vlan 20 is mapped to instance 1, an mrecord is added to the IST BPDU ONLY for port g0/0. However the common denominator here is that the IST BPDU goes out on both ports, thus it looks like a loop to STP and one of them will be blocked. In the above scenario vlan 10 was blocked and our hosts could not communicate! As stated earlier the best solution is to map these valns to different instances, matching the topology, but always avoid instance 0. Leave instance 0 for the BPDU exchange. The less elegant solution is to not prune trunks manually, and to not have access trunks for load balancing. f you need load balancing or more bandwidth, use etherchannels or L3 ECMP. There is a CST root election (all regions can only have 1 CST root). Then there is a region root election (the local region can have 1 root). For traffic to go inter-region, it must first traverse the regional root bridge, then the CST root, then reach the other region. Remember it as each region is treated as a giant switch.